For å få muligheten til å delta, må du sende en søknad til FORF. I søknaden må du si litt om din bakgrunn og din fartstid som frivillig/ ansatt I en av FORF sine medlemsorganisasjoner. Sett også opp hvilke kurs og erfaring du har fra redningstjensten og gjerne hva som motiverer deg for å søke om å få delta. I år har vi fått noe midler til gjennomføring av programmet, så her vil vi kunne dekke reisekostnader til den enkelte. For dere som får muligheten til å delta på dette fantastiske eventyret, må også sende inn en liten reiserapport og evaluering av uken. Noen av dere vil også bli spurt om å holde et lite innlegg FORF seminaret til høsten. Skulle det være noen dere lurer på er det bare å ta kontakt! Da er vi frem til akkurat din søknad! As a part of the cooperation between FORF and ICE-SAR we would like to offer members of FORF to take part in ICE-SAR’s highland patrol. Over the summertime, ICE-SAR operates the Highland patrol in 3 sites in the highland (Landmannalaugar, Nýjidalur and Askja) as well as one site in Skaftafell in southern Iceland. ICE-SAR would like to offer members of FORF to participate in the Highland patrol in Landmannalaugar unless you attended last year and want to try other location. The location reaches over all of the Fjallabak area (mountainous area North of Myrdalsjökull). More information about Landmannalaugar can be found here: bit.ly/LLaugarinfophotos from Landmannalaugar can be found here: bit.ly/Llaugar. Photos from the Fjallabak area can be found here: bit.ly/fjallabak. This is a very beautiful area and in the summer time it is very popular. The area is a mountainous area so that means that you can expect +15°C and sun one day and 0°C and snowstorm the next day. Usually the temperature is around +3 - 10°C The elevation in Landmannalaugar is about 600m above sea level. So, you need to be equipped for these conditions. The facilities that we have in Landmannalaugar are quite humble. We have a very small hut, a container and tents. Many teams that stay there go with a big group and they put up a camp but some are there with a smaller group and stay only in the hut and the container. The hut has 4 bunks and the container 2 bunks so everyone is not able to stay there so most of you will probably need to stay in a tent. ICE-SAR will provide a tent for you to stay in there and you will of course have access to the hut and other facilities that’s there, just as anyone else. The highland patrol is set up because of how many people are traveling around the Icelandic Highlands over the summertime and the long time it will take resources to react to an accident or a search in the area. This is the 12th year that ICE-SAR has teams on standby in the highland like this. The patrol starts at 15:00 on Sunday and is for 7 full day’s. You would need to arrive in Landmannalaugar in time and you would be able to go back on Sunday. 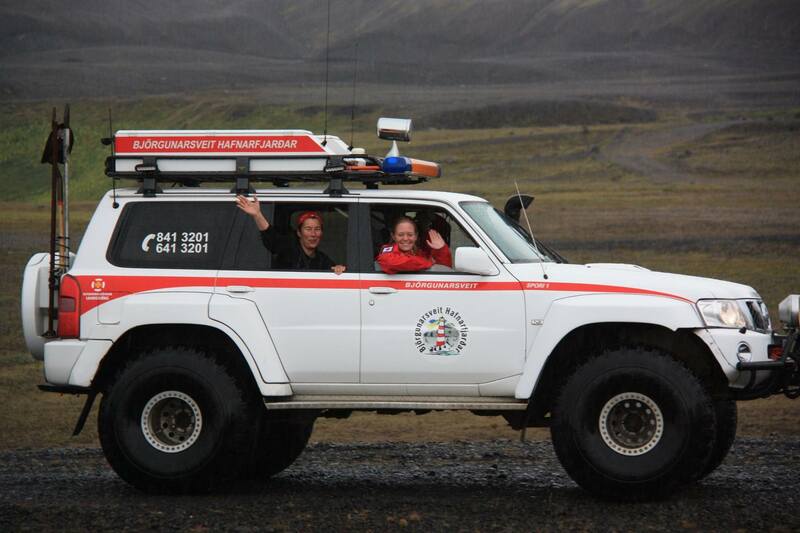 ICE-SAR would get you from Reykjavik – _Landmannalaugar and back by bus or with the team. The callouts for the team there is everything from giving recommendation to hikers, assisting drivers that have got their cars stuck in mud or river somewhere up to Car crashes and starting up large scale searches for lost persons. We have the highland patrol there since it takes such a long time to get there from the next towns/villages so whatever happens these are the first responders. You will be a participant in all call outs working under the supervision and command of the local team leader. · A tent that will be located close to the hut. We also make the requirement that all participants have reasonable knowledge of english. That will be the language most of our team members are able to communicate in. Participants from Norway must get them self to Iceland either by plane or by ferry (by plane is both cheaper and takes less time). You can fly to Keflavik international airport. You will probably need to stay over one night in Reykjavik before you go to the highland patrol and one night when you get back. Flight ticket and accommodation paid by us.